It is surprising that there are so many new Twitter apps coming out since Twitter has started to limit third party app development, but I have found one new Twitter app that is very impressive. 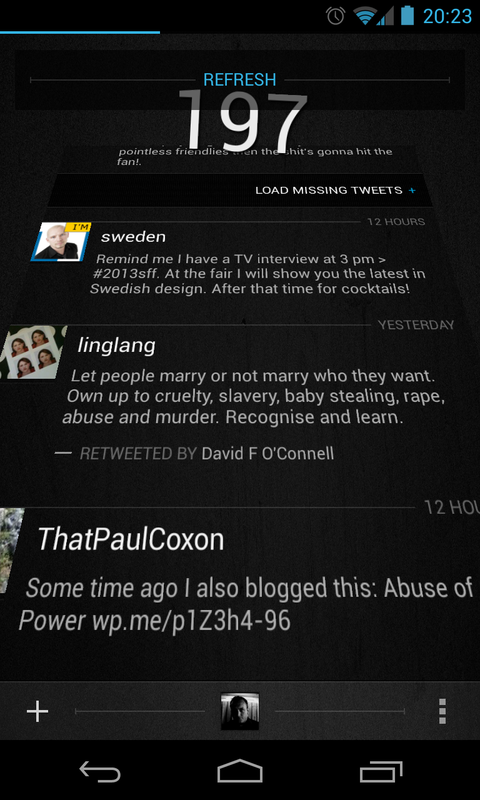 Carbon for Twitter is newly released app on the Google Play Store after being in beta for several months. 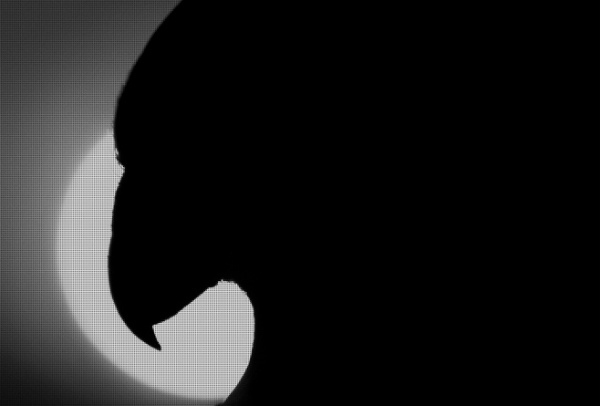 The Twitter app market is full of competitors all vying for the same Twitter users. I will talk about Carbon for Twitter and what features have made me switch to using it as my main Twitter app. What makes Carbon’s user interface great besides the design are the unique animations that are used when you interact with the app. It seems that all Twitter timelines refresh the same way by swiping down from the top, but Carbon adds a cool animation when you swipe down it turns the timeline to an angle and when it is done loading the number of new tweets pops up. When you have tweets with videos or images, Carbon will load these inline on your Timeline so you don’t have to open a new window to view them. Carbon also has a conversation view when you click on a tweet and it includes a cool animation that rotates the original tweet to the background and shows the conversation so you can what other people have said about the tweet. Carbon has three main screens that you can use the screen you first see is your timeline but when you swipe to the left you will see a screen for replies and swiping again will show you your direct messages. At the top of the screen there are icons for each screen and you can switch between these easily by clicking the icon for the screen you want. 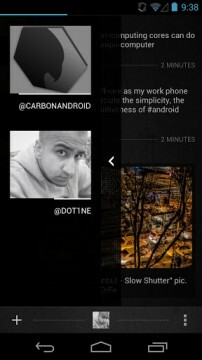 One of the nicest features of Carbon is the ability to setup multiple twitter accounts in the app. This is a feature most Twitter apps do not have and you can setup multiple accounts in the app settings and you can switch between Twitter accounts by swiping to the right. When you click on a tweet it brings up a window showing the tweet and from there you get buttons to reply, quote, retweet and favorite. There’s also an overflow menu (the three-dots menu button) that adds the option to copy the tweet, copy a link to the tweet, or share it via the usual Android sharing options. When you favorite a tweet it is added to your favorites which you can access from the sidebar. The sidebar is opened by the settings icon and is where lists are, you can search, favorites, and accounts. It is very easy to compose a tweet in Carbon and it is like most other Twitter apps except that when you are writing a tweet you have a few options when adding a picture. 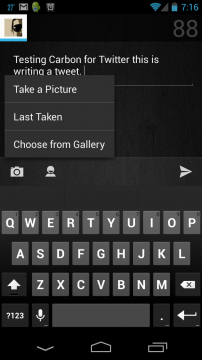 You can either take a picture, use the picture that was taken last, or choose from the gallery. 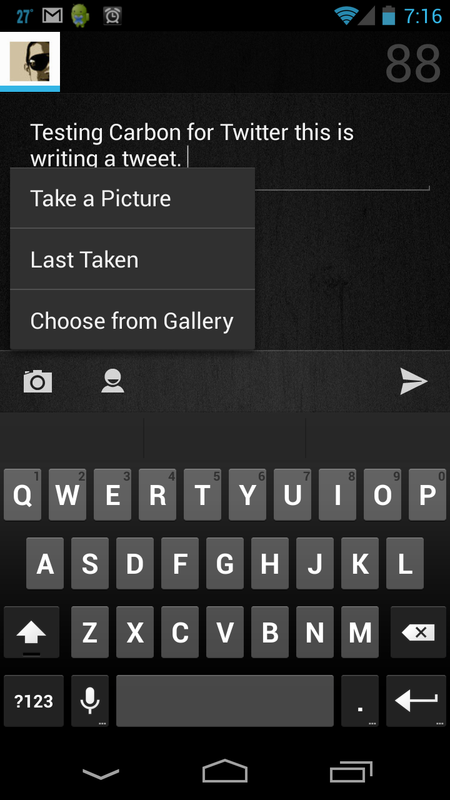 This is a cool feature especially if you take a picture of something cool and want to tweet it out fast you don’t have to look for it in the gallery. When you are writing a tweet you can also choose which Twitter account you want to post the tweet to which is very handy for someone managing multiple Twitter accounts. You can only post to one Twitter account at a time though so it is not like other apps that let you post on multiple accounts. 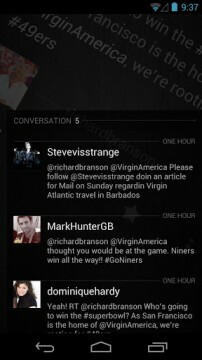 Overall I am very impressed with Carbon twitter app and I thinking about making it my main Twitter app on Android. 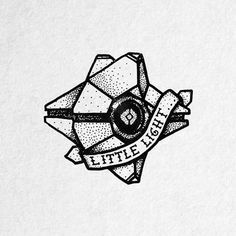 What I really like about Carbon is the design and feel of the app it is nice and simple and does not try to do too much. Carbon has some impressive features like the scroll to the latest tweets on the timeline and the ability to switch between multiple Twitter accounts. 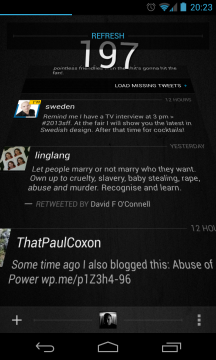 Even though there are tons of other Twitter apps available I think Carbon may draw many Twitter users to its app. Have you tried Carbon and if so what do you think? 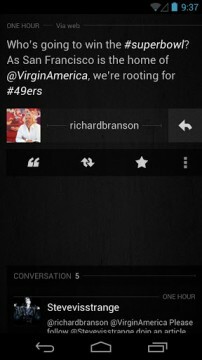 Let me know if there are Twitter apps that you like better for Android.